Not to be confused with Bev. The soda-machine Robot was first seen rampaging with his fellow Robots on Mother's Day in the year 3000 (2ACV14). A few months later, in 3001, he was seen presenting the Oscar for "best soft drink product placement" at the 1074th Academy Awards (3ACV08). He was also nominated for "best actor" at the same awards for his part in Bikini Party Summer. However, the Oscar went to the un-nominated Harold Zoid. Announcing the Best Soft-Drink Product Placement. Nominate for the Best Actor. Multiple Robots of this design were seen throughout Old and New New York as well as the Sewers during the game. It is unclear if any were the same unit as the actor, or even whether the two known speaking soda machines are one and the same. 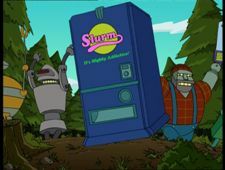 Soda-machine Robot: I've got a big, big thirst for Human blood! This page was last edited on 17 February 2014, at 01:04.